Puntos Vida is a community information service designed to raise awareness about risk factors such as smoking, alcohol abuse, poor diet, overweight, and a sedentary lifestyle. It set up mobile information tents in public gathering places such as bus terminals. Visitors to the tents were offered free screening for blood pressure, weight, body mass index and given information on noncommunicable diseases. Launched in La Paz, to date Puntos Vida has installed over 60 tents throughout the country, including in rural areas. Political commitment. Although it lacks high level political commitment outside of the health sector, the Ministry of Health and Departmental Health Services Office (SEDES) has supported the Puntos Vida program, which is coordinated by the Lions Club. Separate structure. Puntos Vida does not have a separate structure. The Lions Club introduced the program to SEDES in La Paz. SEDES, in turn, integrated the program into its work plan, scaling it up to nine departments throughout the country. Participation of other sectors. There is no evidence that entities outside the health sector are participating in this program. However, various stakeholders within the health sector are involved and others—such as the Bolivian police department—are brought in to assist as necessary. The Lions Club originally steered the program and was later joined by universities, SEDES, the Ministry of Health, scientific societies, and other social organizations. Separate budget. Puntos Vida has its own funding. International cooperation agencies, including PAHO/WHO, provided resources for logistical support. The Lions Club and several universities made staff available to provide services in the tents and assisted with printed materials. SEDES and the Ministry of Health committed financial resources and assisted with the procurement of tents and other logistical aspects. Focus on reducing inequity. 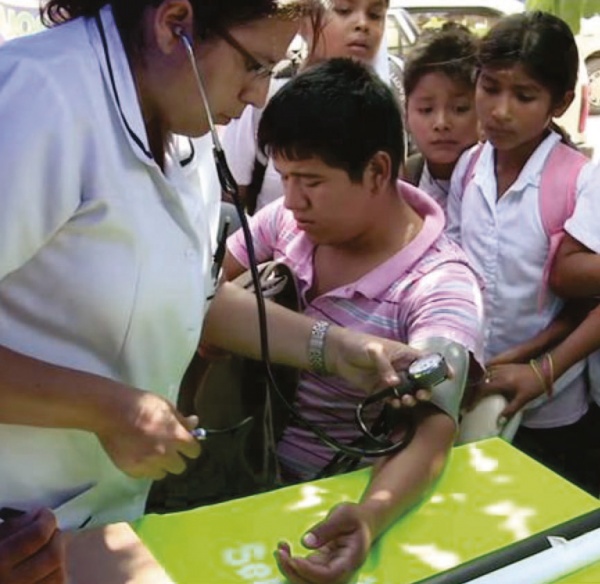 Puntos Vida seeks to reduce inequities by targeting populations in urban and certain rural areas that generally do not have access to health related information. It erected mobile tents in public spaces near underserved areas. Intersectoral action. While the program is not designed as an intersectoral effort, some departments—including Cochabamba and Santa Cruz—created inter-agency committees for its implementation. In other departments, Puntos Vida relies exclusively on the SEDES or Bolivian police department. Public policy. The program is not involved in policy- making on health. While no changes in policy were observed, many SEDES have incorporated the program into their work plans. Evidence of results. While monitoring was conducted, the case study offers no scientific evidence of the program's results. Preliminary results relate to the demand for the program on the part of institutions and communities. Wherever the tents are set up, there are long lines of people waiting to receive information and primary care services. Additional resources are required to undertake a thorough evaluation at the national level. Social participation. Local engagement is limited to local residents lining up to receive information and primary care services. In Bolivia , a Life Point is a mobile tent located in a public place . Anyone can come and learn to prevent the risks of contracting non communicable diseases . The program began in La Paz and has spread to all nine departments of Bolivia . The initiative was started by a civic organization that has achieved to mobilize certain government sectors. The long queues in front of the tents speak of the warm reception that citizens have given to the project. An initiative started by The Lions Club with the Ministry of Health in its current leadership.